Illustration by Jeremy Nguyen for Bushwick Daily. 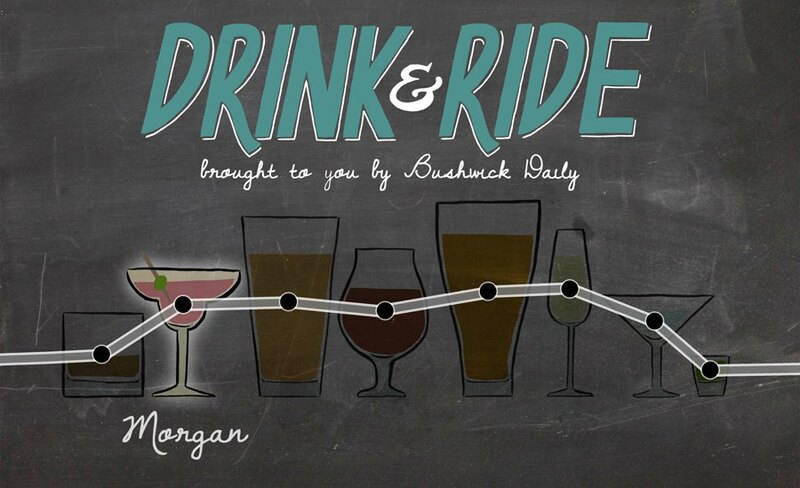 Whether you’ve jumped the turnstiles (not recommended, but we get it) or pony’d up for one last $104 monthly MetroCard before the fare hikes in March, the next L stop on this Drink & Ride gets you to Morgan - previously only a name you associated with girls who played high school field hockey. 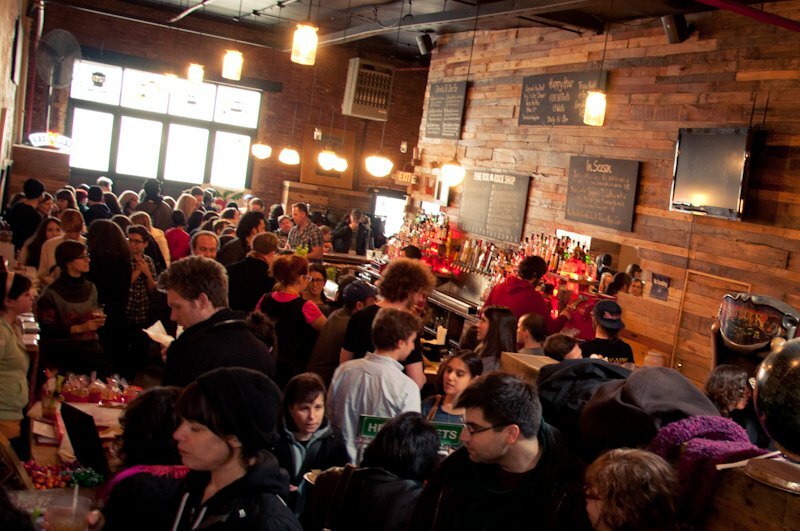 Luckily, there are enough new bars and old favorites near this stop to make your trip worth venturing a little further into Bushwick. With its bare bones, err, bare wood interior, it would be easy to dismiss Pine Box as yet another Brooklyn dive. Au contraire. The factory-like, rustic interior is a vegan’s paradise since all the booze is free from animal products, with the owner going so far as to make her own vegan versions of our favorite spirits. Taste and quality are never comprised; you’ll find favorites like Narraganset Lager ($5), Sixpoint Resin ($6), and Anchor Porter ($6) on tap, plus cocktails using ingredients like homemade pickle brine, candied ginger and Bosco syrup. On a lucky night, you’ll catch live music. On an “unlucky” night, you’ll have to satisfy your concert yen by studying the many tickets beneath the clear bar top, including stubs from LCD Soundsystem, Beastie Boys and John Cougar (Mellancamp, we hope). Before you go, make sure to look up at the mason jar lighting to see a creative use of Brooklyn’s favorite container. 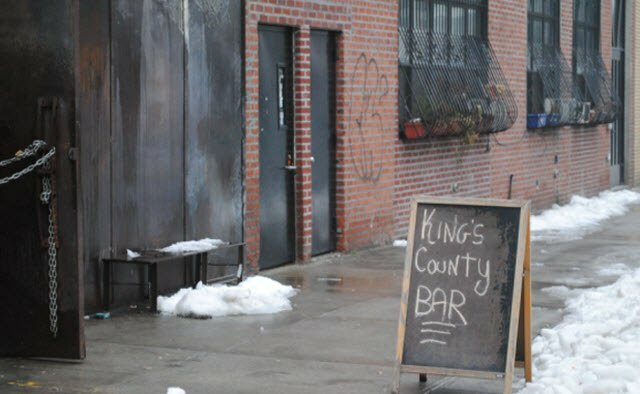 Don’t let the name or iron crown outside fool you, there’s nothing royal about Kings County. Behind its purposely rusted metal façade, the spot’s hole-in-the-wall vibe thrives on the elegance of simplicity – you came to drink and mingle after a long day, so you better get down to it. There’s a basic selection of drafts (Guinness $6) and bottles (Chimay Blue $8), some “good” wine (as the bartender informed us with air quotes), and of course, a healthy collection of Scotch and Irish whiskey. Seating is relegated to thick wood tables and sturdy, so-high-we-had-to-jump bar stools, leaving enough room in the tight space for chatting up other bright, young Bushwickians. Light streams down from a few overhead lamps, each casting a candle-like glow perfect for drinking by yourself in a corner or trying to entice a pretty young thing to drink with you in a corner. The tattooed bartenders are fun, the crowd is attractively eclectic and, yes, there IS a jukebox. 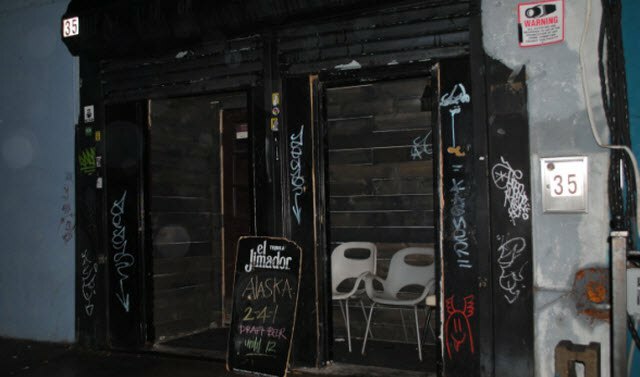 A nondescript sign marks this new addition to the Bushwick bar scene, making it seem less like an entrance to a 49th-state-themed bar and more like the neighbors put out a few chairs to do some people watching. Be careful not to make eye contact with the deer head behind the bar (he knows what you’re doing and he disapproves). The spacious interior has a farmhouse meets flea market aesthetic, with pastoral oil paintings decorating the walls and tables crafted by the owners themselves. Alaska is the type of spot where ordering a bourbon and chatting up the bartender is not only encouraged, but expected. In addition to typically rustic spirits (i.e. whiskey and bourbon), there's eight craft beers on draft to choose from, including Founders American Porter ($7), Sixpoint 3Beans Baltic Porter ($7) and Avery Ellie's Brown Ale ($6). Housed behind the fluted glass windows of an inconspicuous Flushing Ave storefront, The Narrows, an antidote from Bushwick dive bars, is reminiscent of a 1950s lounge, with a sleek, art deco design and appropriately dim lighting. Toast the Mad Men in your life with a selection from their list of draft beers, international wines and handcrafted cocktails with ingenious names like Babushka , a vodka-ginger-based libation ($8). Living up to its name, the narrow interior is dominated by a burnished metal bar, juxtaposed with tucked away booths you can easily imagine the Rat Pack idly lounging in while ordering stiff martinis. Dim, moody lighting completes the '50s throwback vibe and a heated, wood-planked backyard deck lets you drink in the great outdoors year-round. They recently started offering dinner service and shellfish connoisseurs will be pleased to know they offer $1 oysters everyday ‘til 7pm. Cash only. A graffiti-heavy typical Bushwick dive that’s anything but typical – at least, that’s what we think Mrs. Doubtfire’s photo behind the bar is trying to tell us with her eyes. 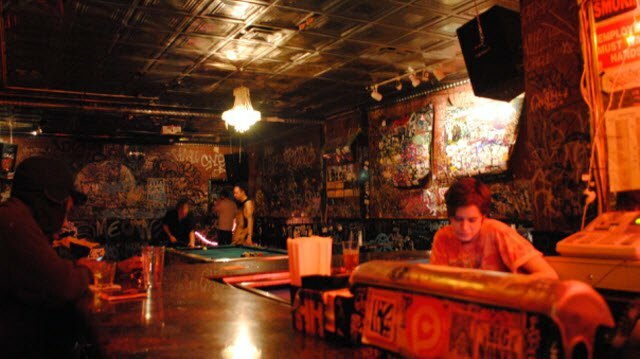 With a Día de los Muertos meets punk rock basement vibe, you’ll find typical subversiveness expected from this part of town in the faux crystal chandelier centered above mangled vinyl booths or the “Skate or Die” bumper stickers adorning the taps. The Wreck Room's cavernous space is home to pool tables, video games, $5 Tecates and a $6 Miller-and-whiskey special, easily recreating the kinds of joints you frequented in college – and luckily, the prices match. 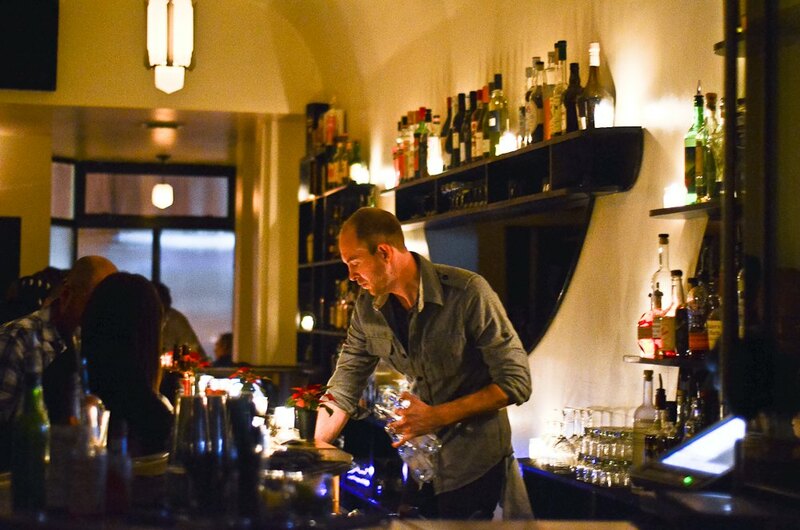 With willing-to-have-a-weird-conversation bartenders and a communal “let’s drink til it hurts” attitude, it’s the type of place where sobriety probably isn’t an option.